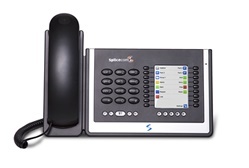 Splicecom SelectVoice supports an extensive range of feature-rich IP telephones. 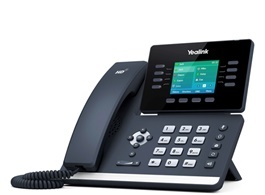 Any combination of Splicecom's own PCS phones or the Yealink range of IP phones is supported on the system. Splicecom's PCS 573G IP Phone exhibits a full colour graphics display, eighteen intuitive, multi-functional, context sensitive keys and bold, instantly recognisable icons combined to deliver a user experience more readily associated with mobile phones than business telephony. The PCS 573G also offers an integrated, two port, Gigabit LAN switch allowing it to be run 'in serial' where Gigabit Ethernet has been deployed to the PC. Similar in design to that of the PCS573, PCS 563 exhibits a full colour graphics display, with nine multi-functional, context sensitive keys. Including an Out of Hours operation that automatically blanks the screen to save energy. The PCS 563 has a dual port 10/100 dual Ethernet connection. The PCS 553 is suited for deployment in many business environments. The PCS553 has a two colour backlight monochrome display with 8 context sensitive buttons for navigation of features Identical in appearance and operation the PCS553 comes with a dual port 10/100 dual Ethernet connection whilst the PCS553G has two gigabit Ethernet LAN ports. The entry-level PCS 542 is a cost-effective desktop IP phone, specifically designed to work with SelectVoice systems. The PCS 542's ease-of-use makes it the ideal choice for those who require an attractively priced, well featured telephone. The PCS542 has 4 context sensitive keys, 10 fixed feature keys and can be combined with Navigate Pro or PCS60 to provide additional features. The PCS542 has a 10/100 dual Ethernet connection. Executive touchscreen phone with 7" 1024*600 pixel capacitive touch screen. Featuring integrated HD Audio, WiFi, Web Browser and Bluetooth, plus dual 10/100/1000 Ethernet Ports. The T58V includes an integrated 720p HD Video camera and supports 3 way video calling, this is an optional addition to the T58A. Similar in appearance to that of the T58V, T56A is a simple-to-use smart media phone that provides an enriched HD audio experience for business professionals. This smart media phone enables productivity-enhancing visual communication with the ease of a standard phone. Based on an Android operating system, the T56A features a seven-inch fixed multi-point touch screen, integrated Wi-Fi and Bluetooth and a built-in web browser. The T52S is an easy-to-use smart media phone boasting a 2.8 inch colour screen, distinctive design and an intuitive user interface. 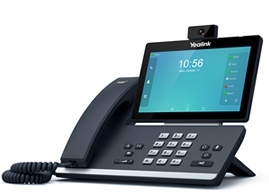 Yealink's HD voice technology, delivers superb audio quality and crystal clear voice communications. Offering built-in Gigabit Ethernet and Bluetooth, the T52S enhances collaboration and productivity when used with Splicecom's SelectVoice solutions. The stylish T40G is a feature-rich SIP phone ideal for everyday office users. 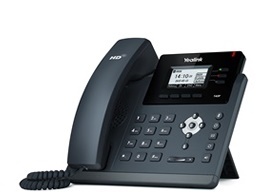 This Gigabit phone benefits from an intuitive interface, BLF's, HD Voice, 3-way conferencing, handsfree speakerphone and supports corded or wireless headset with EHS. Splicecom's Operators Console has been specifically designed to elevate business productivity and enhance the overall company image at the main point of customer contact by delivering an improved operator service. By utilising the standard PCS 60 application and expanding its capability through the addition of the Operators Console Licence, Splicecom's PCS 60 Operators Console has been specifically developed to partner with Splicecom's innovative PCS system phones or existing analogue phones. The PCS 60 Operators Console can be deployed in single screen or dual screens mode and runs under the Microsoft Windows or Apple Mac OS X operating system. 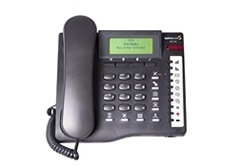 Alternatively it can be used with a USB/Bluetooth, handset/headset as an IP Softphone. The PCS 60 Operators Console can also be deployed with a touch-screen monitor to deliver direct operator control. Navigate Pro is the Unified Communication,-UC, client app that delivers the ultimate flexibility in business productivity. Now you can have all the benefits of an advanced UC service using SelectVoice, regardless of what desktop phone you use. Navigate Pro offers the full range of traditional phone features, all controlled by the click of a mouse. Navigate Pro has been designed to offer screen based phone management and control alongside advanced integration with both Microsoft Skype For Business and Outlook. 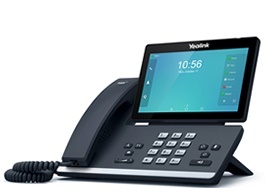 Available free of charge for all SelectVoice users, Navigate Pro Partner mode delivers call features through the PC to a broad range of Yealink SIP and Splicecom PCS desk phones as well as existing 3rd party analogue phones. Partner mode is often preferred to Softphone mode when the user does not wish to rely on their PC for all communications. Simply answer the call by picking up the handset and quickly receive features such as searching and dialling from Outlook contacts via the PC. It's the best of both worlds! Alternatively, Navigate Pro allows you to dispense with your desktop phone altogether. In Softphone Mode, Navigate Pro becomes the perfect all-in-one business phone solution enabling you to make and receive phone calls from your laptop/PC. Ideal for the infrequent phone user, staff who take a high volume of calls and prefer a headset, for the mobile workforce, for those working at home, for situations where desk-space is at a premium, or those who simply want to save desk phone costs. Splicecom's iPCS application takes Office Mobility to its logical conclusion, enabling Apple and Android Smart Phones and Tablets to be utilised as highly featured maximiser business phones, replacing the need for DECT or SIP/WiFi wireless phones. Providing a fully integrated IP Phone solution for the entire workforce, iPCS works in the same way as SpliceCom's PCS system phones, empowering employees with access to key business features wherever they might be, at their desk or away from it.